The Jewish Encyclopedia, long before the Balfour Declaration, speaks of Palestine and the people of Palestine. The entire 1906 edition of The Jewish Encyclopedia is available online at: http://www.jewishencyclopedia.com/. You can see the results of a search for the word Palestine in the online version at: http://www.jewishencyclopedia.com/search?utf8=%E2%9C%93&keywords=palestine&commit=search. The Encyclopedia describes a Palestinian Haggadah, composed in Palestine, from Palestinian sources. The Encyclopedia also speaks of the late 1800’s Jewish interest to colonize Palestine. A page of Jewish seals shows the seal of a Palestinian Jew. The seal has both Hebrew and Arabic script. Before Balfour/1917, PalestinianJews, Palestinian Christians, and Palestinian Muslims coexisted peacefully. Among the many references to Palestine and Palestinians is this photograph of a Palestinian shepherd and sheep. This 1936 telegram from the Palestine Jewish Colonization Association exhibits how some people involved in the immigration of Jews to the Holy Land felt that it was a colonization effort. This June 14, 1949, UN report describes a massacre of Palestinian civilians in the town of Dawaymeh. The horrific story of the “barbaric” massacre was also described in a report from one of the Jewish Israeli soldiers. James Zogby describes his first hand experience witnessing apartheid in Hebron in this post. Once vibrant areas have been changed to ghost towns. Jews and non-Jews live under different laws. Former Israeli soldiers who served in the area can show you first hand what is happening. La Geographie de la Palestine is a 1938 book, written in French, that describes the geography of Palestine. The book describes the geographie of hundreds of cities and villages. The book also includes pull-out maps of the Holy Land. In these maps, towns are identified all over the Holy Land, west of the Jordan River, from the Sea of Galilee to the Dead Sea (Mer Morte). The land was called Palestine long before the 1948 war that created Israel. Were the people living there “Palestinians”? Surely they thought they were, but does it matter what we call them? Judaism teaches that it is not ok to expel peaceful non-Jewish families from their homes, irrespective of what we call them. The Jewish Museum of the Palestinian Experience has maps of Palestine dating to the 1700’s. You can find and download them here. Learn more at the Jewish Museum of the Palestinian Experience. The Israeli newspaper Ha’aretz is a source of information on topics that often don’t get coverage in the United States. Here are links to Ha’aretz articles that provide some information on how Palestinians came to become refugees in 1948. An Israeli Prime Minister tells of his first hand experience in how tens of thousand Palestinian men, women and children from Lydda and Ramle became refugees. 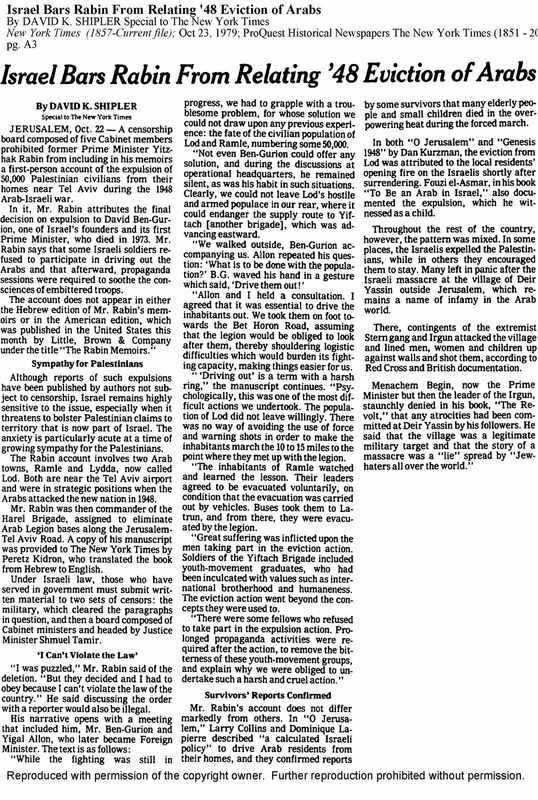 This 1979 article from the New York Times describes his experience and how that experience was censored from Rabin’s book. The full article is republished here. Download the Promised Land Museum brochure. It provides highlights from each of the museum’s main exhibits. Use the meshtags in the brochure with the Meshtag app (which you can download to your Android or iPhone) to access museum video and other content directly to your phone. Share the link to the brochure with others who you think would find it useful or interesting. Khirbet Khizeh is a brief, fictional, 1949 novella about the violent expulsion of Palestinian villagers by the Israeli army. Considered a high point in Hebrew literature, it was published just months after the end of the 1948 war (in which the author fought). The book provides a window on the perspective of a Jewish soldier whose unit expels peaceful Palestinian families from their homes. At my Hebrew school, we were taught that we Jews came to an empty land of deserts and swamps in Palestine and made them bloom. We were taught that Arabs were jealous of us and of our accomplishments. We were taught that Palestinians fled at the call of Arab leaders in order to further the killing of Jews. Somehow, this didn’t seem congruous with a 1948 refugee population of over 700,000 Christian and Muslim Palestinian men, women and children. Only later did I learn of Haganah Plan D, written war plans in the Israeli Defense Force archives calling for destruction of Palestinian villages (setting fire to, blowing up, and planting mines in the debris) and the expulsion of their population. Israeli historian Benny Morris described massacres, rapes and expulsions perpetrated against Palestinian. I could only guess at the details of what that was like. Then I read Khirbet Khizeh, a 1949 novella of a Jewish soldier describing the day in 1948 in which his military unit attacks a Palestinian village and deports its inhabitants. The book is written by S. Yizhar, the pen name of Yizhar Smilanski, a Sabra, born in Rehovot, Palestine, in 1916, longtime Labor party member of the Israeli Knesset, and winner of the 1959 Israel Prize. Yizhar describes the dehumanization of the Palestinians that makes it possible for the Jews in this unit to treat Palestinian civilians so horribly. “What beautiful places they have,” said Gaby. “Had,” answered the operator. “It’s already ours.” “Our boys,” said Gaby, “for a place like this, we would fight like I don’t know what, and they’re running away, they don’t even put up a fight.” “Forget these Ayrabs—they’re not even human,” answered the operator. I’m left wondering if the dehumanization of “Ayrabs” that let good Jewish boys like Moises, Gaby, Shmulik and Aryeh act this way was at all similar to how Gerhard, Werner, Fritz, and Helmut thought of the Jewish people they rounded up and put on trains. What are we doing? We continue to kill and to expel. We do it in the name of security, as though the Palestinian Christians and Muslims are animals who we have to wall off. We now know that our treatment of them was no better in 1948 than it is today. The killing we do in the name of our own security is not done in the cause of justice but in the cause of creating a state run by and for Jews at the expense of other good people who were already living there. The security we desperately seek isn’t to be found in more killings and more expulsions but in acting in accordance with our principles, in living together in peace with Christians and Muslims, and in repatriating our brethren and rebuilding together. Feldman is author of Compartments: How the Brightest, Best Trained, and Most Caring People Can Make Judgments That are Completely and Utterly Wrong (www.compartmentsbook.com). He is also author of A Jewish American’s Evolving View of Israel (http://www.acjna.org/acjna/articles_detail.aspx?id=529).